“Livescream” is a found footage film and horror movie that was written and directed by Michelle Iannantuono. The film follows an avid gamer and video blogger who unwittingly plays a new online game only to realize that the stakes are real. 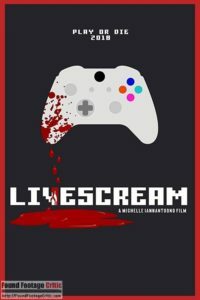 Livescream (2018) opens with a live streaming video gaming session. 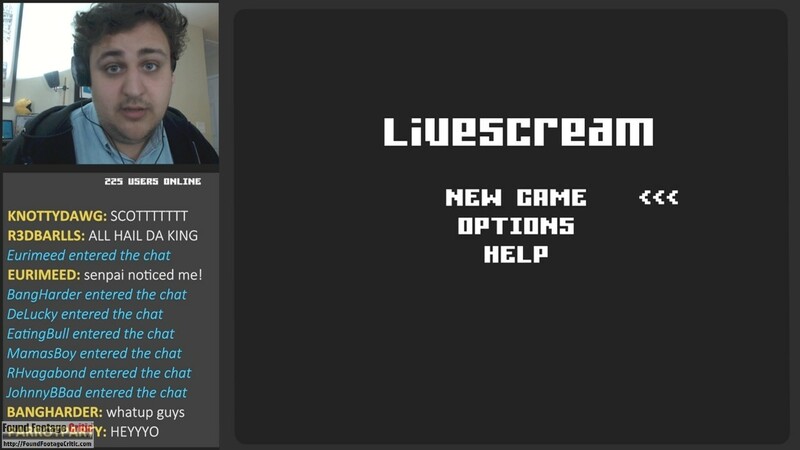 Scott, the host of the stream, enthusiastically announces that he’ll be playing “Livescream,” an obscure horror game recommended by one of his many online followers. 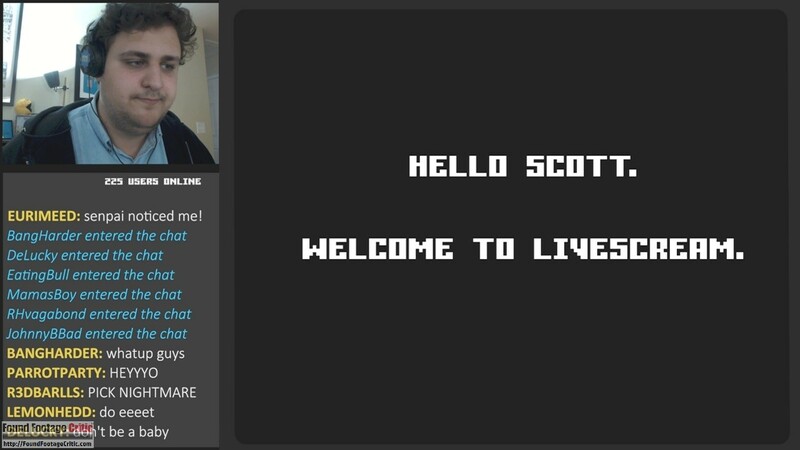 Hundreds of Scott’s subscribers are logged in to watch the live gameplay and banter via a chat window off to the side of the main screen. As Scott starts the game, he is unnerved by the fact that the game knows his name. However, Scott’s apprehension quickly subsides once he starts playing—he is disarmed by the rudimentary graphics and gameplay, which are a throwback to a late-1990s/early-2000s first-person shooter (FPS) game. 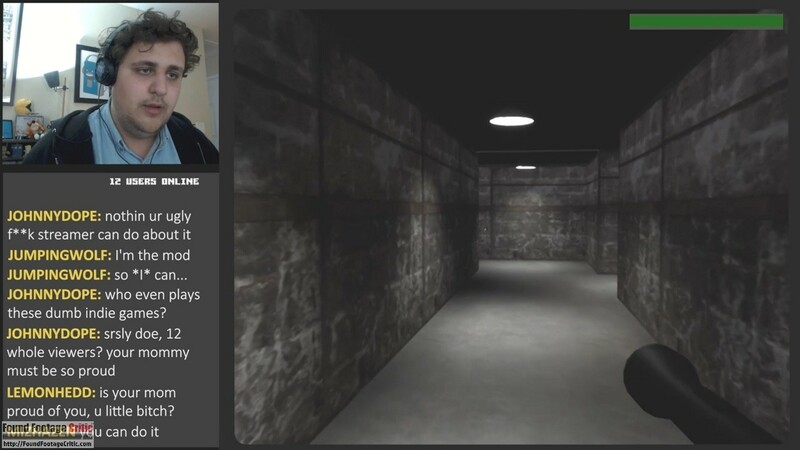 Scott’s concern takes root once again shortly after losing his first life on level-one of Livescream. 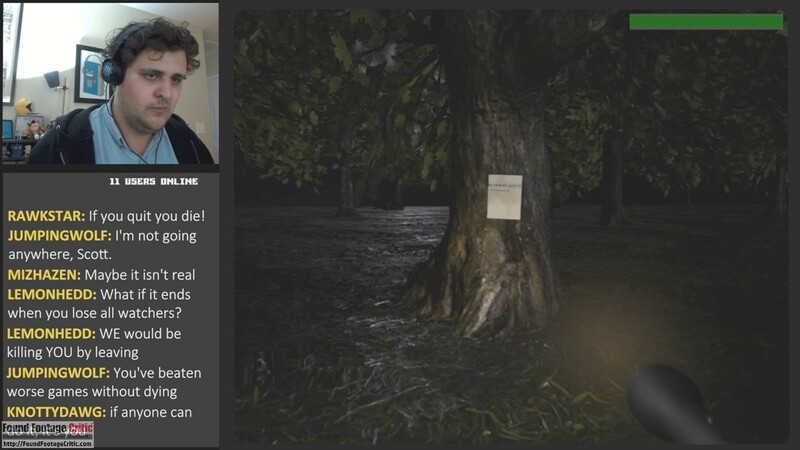 In the chat window, one of Scott’s subscribers writes that he that he hear’s something in his house that sounds like the monster that killed Scott in the game moments earlier. The subscriber makes a plea for help and mysteriously logs-off. Is one of Scott’s followers playing a joke or is this real? The footage reveals the unsettling truth. The found footage cinematography in Livescream (2018) is nothing short of pristine. The perfection of the footage is matched by its simplicity—the overwhelming majority of the live-action footage is captured via a Logitech webcam headshot of the main character (Scott) and is presented in a thumbnail-sized window in the corner of the screen throughout the film. 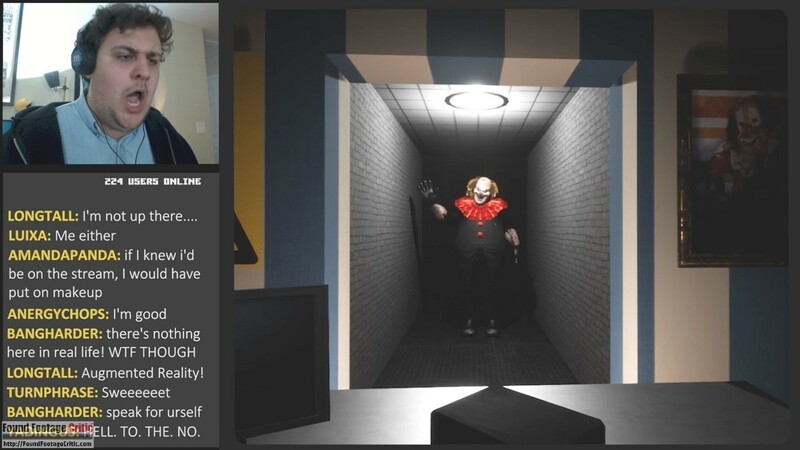 Livescream (2018) contains several scenes of Scott’s online followers (in tiled thumbnail windows), but these scenes are very short, and far and few between. 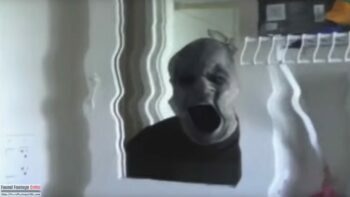 The cinematic approach used in Livescream (2018) bears a strong resemblance to Unfriended (2014). Both films utilize tiled thumbnail-sized windows to capture live chat sessions. Livescream (2018) leverages a fictitious online web service that is a hybrid of the YouTube Gaming, Twitch.tv (a live video streaming service focused on gaming), and a Facebook Live session. Conversely, Unfriended (2014) relies on the very real Skype platform, a decision that was most likely tied to the film’s large budget and studio-backing. In either case, director Michelle Iannantuono didn’t see Unfriended (2014) until after she finished filming Livescream (2018). Livescream (2018) is a plausible representation of the Let’s Play culture, where gaming enthusiasts record their gameplay to share with other gamers. Aside from Scott, the main protagonist, another poignant (albeit virtual) character in Livescream (2018) is the game itself. The game is represented as graphics of animated 3D environments accompanied by periodic text messages from the game itselt, that appear in-between levels and gameplay. The filming reasons employed in Livescream (2018) are quite good. First and foremost, the reasonable assumption can be made that the online gameplay was recorded by the film’s protagonist. 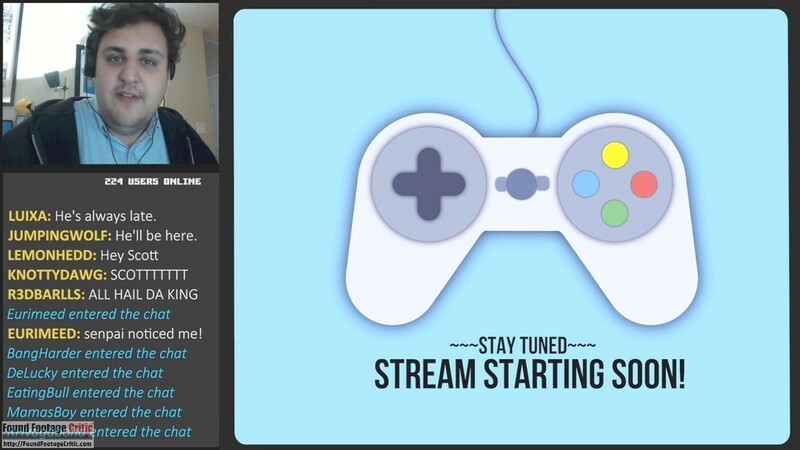 Services such as the YouTube Gaming and Twitch.tv enable users to host and record live streaming gaming sessions for followers to watch at a later date. Specific plot points of the film (which won’t be mentioned to avoid spoilers) also lend credence to the possibility that the game itself recorded the gaming session. Both filming reasons are plausible, and not knowing the truth only bolsters the mythos of the story. The found footage purity is a measure of how accurately a film is portrayed as actual found footage. This review factor considers cinematography, filming reason, sound, plot, and a myriad of other variables. 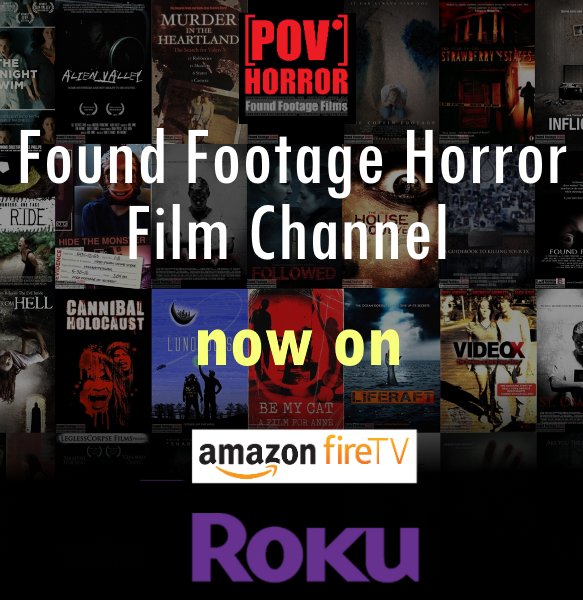 Livescream (2018) does a very good job maintaining its found footage conceit. 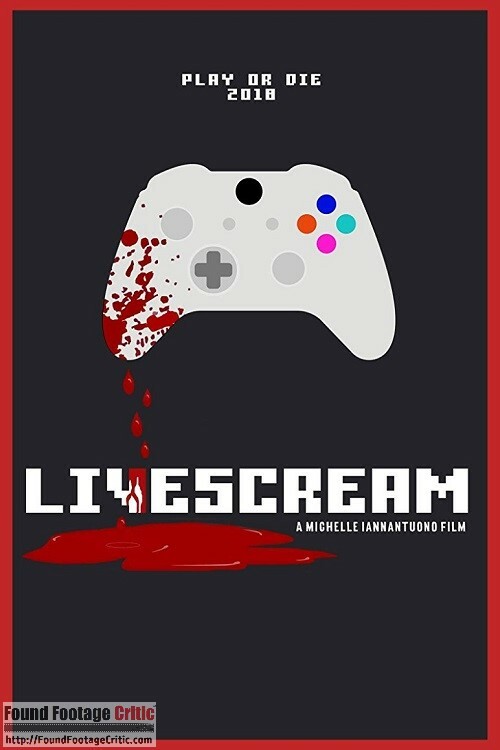 The minimalist cast, simple set design, and artificial gaming environments (compared to a traditionally shot film) offered director Michelle Iannantuono an unprecedented level of control over the look and feel of Livescream (2018) and the film’s adherence to something that could possibly pass as real. Michelle Iannantuono is to be commended for using the in-game soundtrack as the mood music in Livescream (2018). She uses the music to build tension during the gameplay and set the emotional tone during chat conversations between character Scott and his followers. Also feeding into the reality of the film, the gameplay comes across as an authentic late-1990s/early-2000s era FPS game. Director Michelle Iannantuono built the 3D gaming environments using the Unreal Engine, a drag-and-drop gaming toolset used by non-programmers to quickly prototype and publish gaming environments. The Unreal Engine was the foundation for most popular FPS games in the 2000s and is responsible for the engine’s namesake Unreal 1-4, and was inspired by the development work on the mid-1990s Quake and Doom series. While Livescream (2018) wonderfully maintains it’s found footage purity, the film is not quite perfect. During the film, one of Scott’s followers says he is unable to log out of the video streaming session. Over time he becomes increasingly agitated due to his inability to leave the live stream. The question that this reviewer kept asking is, why doesn’t the follower simply shut his browser, briefly disconnect his Internet connection, or reboot his PC? Omitting this exchange altogether would most-likely have avoided the issue altogether and removed any break in the suspension of disbelief. Despite this one inconsistency, director Michelle Iannantuono created a world that for all intents and purposes looks and feels real. With minor exception, Livescream (2018) is comprised of a cast of one—Gunner Willis. Gunner Willis performs wonderfully as the gaming enthusiast, Scott. His character is personable, has a strong moral center, but like most people, carries personal demons which are revealed later in the film. Gunner Willis delivers a seamless performance and effortlessly carries the film as his character Scott interacts with his hundreds of online followers. Viewers of Livescream (2018) are likely to forget the fact that the there were no followers, only Gunner Willis reading his lines. 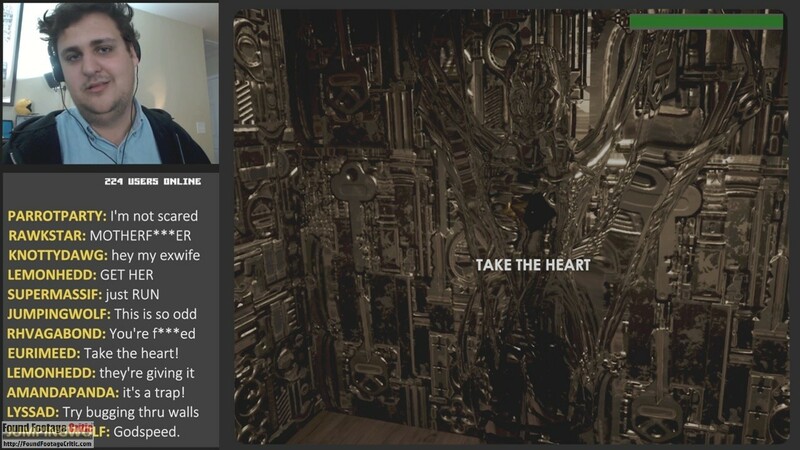 We asked director Michelle Iannantuono to walk us through the process of how Gunner Willis performed against the text chats and video game simulations, which presumably required a good deal of coordination. Here’s what she had to say, “The chat was created line by line in Adobe Premiere, so it was pre-recorded. Gunner acted against the pre-recorded chat and gameplay footage (basically whatever you see in Livescream, Gunner saw when he acted). It wasn’t ‘quite’ timed correctly when we shot, so I was nearby pausing the prerecording whenever the timing got off so that he would have room to breathe, and not feel rushed if he wanted to take his time with delivery. Then, the chat and everything else was nudged in post-production, whenever necessary, to better match his performance. A couple of the games were recaptured when Gunner was around, to better match his pacing. It was definitely a chicken and the egg thing, of Gunner needing something to react to before he could act, but I needed his sense of pacing before I could time and record the gameplay/chat, so we went back and forth through a lot of rehearsal trying to nail down a version we could actually shoot the movie against. Livescream (2018) is a unique found footage film that enters uncharted territory for the genre. 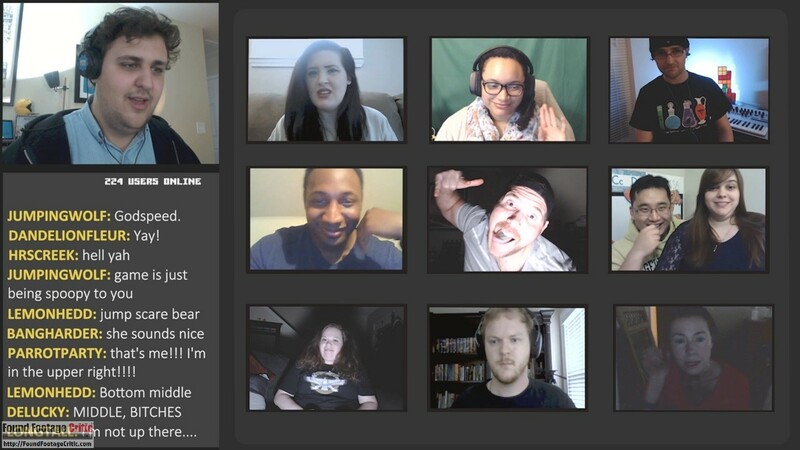 Films like Unfriended (2014) and The Den (2014) examine social media, but before Livescream (2018), there were no found footage films that explored the online gaming culture. And there certainly are no other found footage films that used online gaming as the vehicle to deliver a story. In this regard, Livescream (2018) is truly unique. Found Footage Critic asked director Michelle Iannantuono about her inspiration behind the film, “I’ve spent four straight years immersed in Let’s Play culture, particularly in the niche of indie horror games. Nearly every creative choice I made for Livescream was inspired by a game, a game player, a game developer, a reference to a popular video, or some aspect of the culture. Over these years I have observed, and felt in my own heart, the deep, intimate connection between streamers and their fans.” To this end, director Michelle Iannantuono accurately captures the essence of the Let’s Play culture, right down to the sensibilities of the gaming enthusiasts. Setting aside the great acting of Gunner Willis, Michelle Iannantuono manages to personify and create empathy for a group of virtual characters (i.e. Scott’s followers), who only exist in the form of a text chat—which is a noteworthy accomplishment in and of itself. Livescream (2018) is a relatively short feature, coming in at 66 minutes, but don’t be dissuaded by the film’s runtime. The movie is briskly paced, has a great story, does a great job building tension, and is always visually interesting. 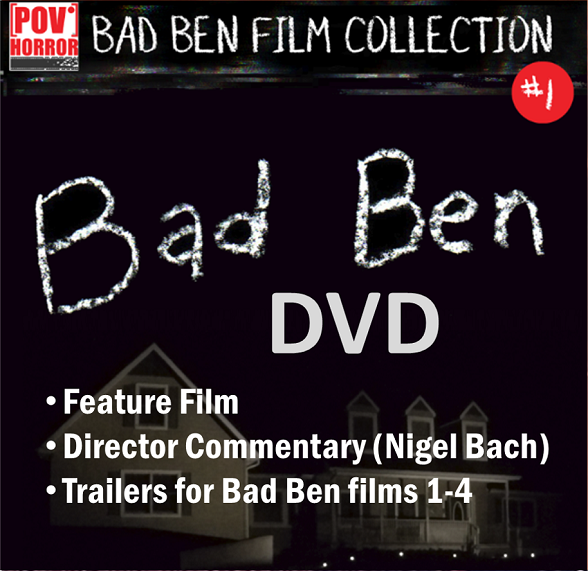 This is a found footage film you won’t want to miss. LIVESCREAM is a unique, engaging, and well-paced found footage film that leads the genre into fresh, unexplored territory.